Happy New Year of the Horse 2014! After Pencil Revolution’s Wopex post and the following discussion on how to sharpen a Wopex: a photo of a Deli 0668 sharpened Wopex. Typical pattern created when sharpening a Wopex with a cylindrical sharpener. Click to enlarge. For many months now I have hardly ever sharpened my Wopeces with anything other than a Deli 0668. For that purpose I have one Deli 0668 at home and one in the office. The 0668’s angle of 20° is more suitable for the Wopex than the more acute angle of ~17°-18° the Deli 0635 will produce. One warning though, the hardness of the Wopex can make the auto-stop fail. 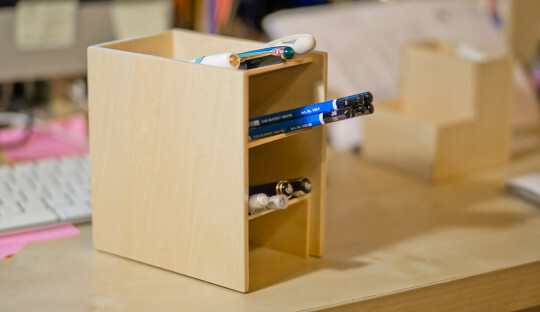 If you notice that the sharpener doesn’t stop, release the pencil holder (back to it’s original position) to avoid more of the pencil being fed further towards the burr cylinder. To finish the sharpening process just keep turning the handle until there is no more resistance . A fake Noris. The company behind it didn’t try very hard, but I’m sure many customers who are not so familiar with pencils will buy this pencil because of the familiar colours and patterns. It even features a black strip between two yellow sides. Long time readers might remember my blog post about the Reynolds 432 and the Nataraj 621, both of which look pretty much like a Staedtler Tradition. There are also countless Staedtler Noris copies – previously I’ve mentioned the Fox Essentials. Recently, I’ve come across a quite cheeky copy of the Noris, when one of my students was using it in class. I call it a cheeky copy, because it features a red cap, just like the original Noris …but the copied pencil’s cap is rather ugly in compared to the original. The Noris eco is my daily pencil. The Leuchtturm Loop has been reused from a previous diary, thanks to a paper riveter. A few weeks later I also finally got my hand on a Noris eco. I planned to get one from Cult Pens when I order from them again, but then I saw the Noris eco in WH Smith, where they sell for 85p (~$1.40; €1.05) each. I also had a look at my local Ryman, but they didn’t sell them there, even though they sell them in their official eBay outlet1. The lovely Noris eco is now my daily pen in my diary’s loop. One thing I noticed: the green colour of the Noris eco seems virtually identical to the Wopex in 2H. While the Noris has a more complicated pattern2, the Noris eco has a simpler pattern3. I assume this is because it’s not so easy to extrude a thin black strip precisely over a corner. Now, if the Noris eco is just a green Wopex with black strips and if there are fake Noris (plural: Norises?) anyway, why not make your own (fake?) version from a yellow Wopex? I’ve only ever seen the yellow Wopex in Asda and on Ebay. I assume the ones on eBay were bought in Asda, where they are very cheap. To increase my chances of getting acceptable looking black strips on the pencil I decided to cover the areas not to be painted with a tape. The taped Wopex. The tape dispenser in the background is an old Bakelite model. I then used a permanent marker to paint the Wopex. As you can see it all went belly up. Somehow the tape didn’t stick well and the lines from the black marker were not very straight …so I didn’t bother to do the thin strips carefully either. If you want to try it and are successful: Try to do the red cap using nail polish. Pencil Revolution has further instructions. I’d like to thank Kamil Musial for showing me the “Stationery” Staedtler Noris copy. Originally I planned to put this on the Bleistift Facebook Page, but it’s so good that I couldn’t resist and had to post it here. The Scantron comic is licensed under CC BY-NC 2.5. You can find the original at xkcd.